Carnegie: Magic Detective: Maro's Ghost! I’ve only shared this story with one other person. Looking back, it might have been an ideal Halloween story to share. At any rate, I’ll share with you the story of my experience with Maro’s Ghost. Back on September 19th, I was in Leland Michigan performing at the Old Art Building, also known as the W.T. Best Theatre. I was there to present two magic shows during the day and one lecture on the Great Maro in the evening. When I had arrived one of the folks there told me the story of the ghost in the building. They jokingly wondered if it was Maro. I was even told that an outdoor video camera once captured images of mysterious orbs in the yard area one weekend. I chuckled, as I usually do at such things. Fast forward to the afternoon performances and the first show went quite smoothly. The second show was coming up and I was busy resetting props and making sure everything was where it needed to be. Once everything was set, I looked out to see how many people were there. We held the curtain an extra minute or two to allow for more folks to come in. At showtime I opened with one of my signature routines. A magic routine that I have been doing for well over 20 years. All was going well until near the end of the routine when something happened that never happened before. By the way, the trick was a giant version of the Linking Rings using Hula Hoops. The calamity that happened at the end of the routine was that all 4 hoops seemed to knot themselves together. I don’t know how else to describe it. They were interlocked in such a way that I couldn’t get them apart at all. I pulled and tugged and finally held them up in the clump as if that was the end. I doubt the audience knew what had happened. But in my mind I was befuddled. After the show, I went back to the clump of hoops to figure out what had caused them to join together in such an odd fashion. But, as I picked them up, they were once again four separate hoops, not stuck together, not joined in anyway. I have since attempted to get the hoops tied/knotted up in the same way and cannot duplicate it no matter how I try. I have a specific series of movements that are identical every time and it simply does not allow for this odd occurrence. Yet, that afternoon, something unusual did happen. As I’ve mentioned in previous blog articles, the evening’s lecture on Maro went off without incident. Everything went perfectly. But then again, Maro was the star of that program. Do I really think it was a ghost? No. But it has left me scratching my head ever since. I wonder if anyone read my article about Maro in the November Linking Ring? I've not seen it and would love to know how it turned out. 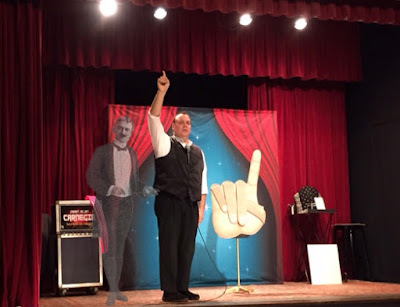 The next episode of The Magic Detective Youtube Show will have video from Leland Michigan. And I think I've finally figured out the proper format for doing that show. The show will go up on Youtube as it has in the past and the blog will contain further information not covered on the show. And I'll include a link to the video, but I won't be embedding the video in the articles anymore. Hopefully that works out better than I've done it in the past!